PUNE (HOSUR): TVS Motor Company, a reputed manufacturer of two-wheelers and three-wheelers in the world, today, announced that their 110cc commuter motorcycle, TVS Radeon, has crossed the 1 lakh sales milestone. The motorcycle boasts of multiple first-in-class features and usage-led design, offering strength, comfort, and style without compromising on its performance. Within 7 months of its launch, TVS Radeon has witnessed immense demand from the target audience across the country. TVS Radeon promises a sturdy and reliable experience for its customers, complete with a solid body, which is complemented by a strong steel tubular chassis. The motorcycle is equipped with Synchronized Braking Technology1, a first-in-segment feature, which provides superior braking control and minimises skidding, thus ensuring the safety of the rider. The key advantage of Synchronized Braking Technology is that it reduces the braking distance and improves stability, while braking. SBT ensures that the front brake is automatically engaged whenever the rear brake is applied. TVS Synchronized Braking Technology further enhances the braking performance of the vehicle, by reducing braking distance upto 10%, with respect to comparable braking systems. TVS Radeon bespeaks a unique classic look with its stylish petrol tank’s ribbed thigh pads, a chrome finished speedometer, shock absorber shroud and silencer. TVS Radeon houses a long-lasting 109.7cc Dura-Life engine, which is designed to offer an optimum combination of power and fuel economy. The motorcycle churns out 8.4 PS of power @ 7000 rpm with a torque of 8.7 Nm @5000 rpm. 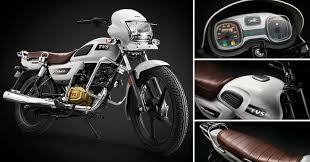 TVS Radeon is equipped with 10-litre tank and clocks a fuel economy of 69.3 kmpl2. With a 5-year warranty, TVS Radeon comes in a colour selection of White, Beige, Purple and Black.